If there is no immune system,it seems like vaccines wouldn't do much since there is no adaptive immune system to develop antibodies and memory cells. But can people with AIDS/HIV still be vaccinated? It is expected that a normal person will have antibodies to attack the minimal infection produced by the vaccine and generate memory cells, but without an immune system I expect vaccines to be deadly. Can the immune system still mount a response to the vaccine? Yes. HIV infection does lead to a decreased immune response. Though the primary deficiency is a decrease in both CD4+ (helper) T-cell count and function, there is, perhaps consequently, B-cell dysfunction as well. This would suggest that vaccines are less immunogenic. When this is studied directly, as would be expected, we see that vaccines are less immunogenic, but they are still effective. Can people with HIV still be vaccinated? No (most of the time) if the vaccine is an attenuated vaccine, this means it contains living organisms that have been modified in order to reduce their virulence. 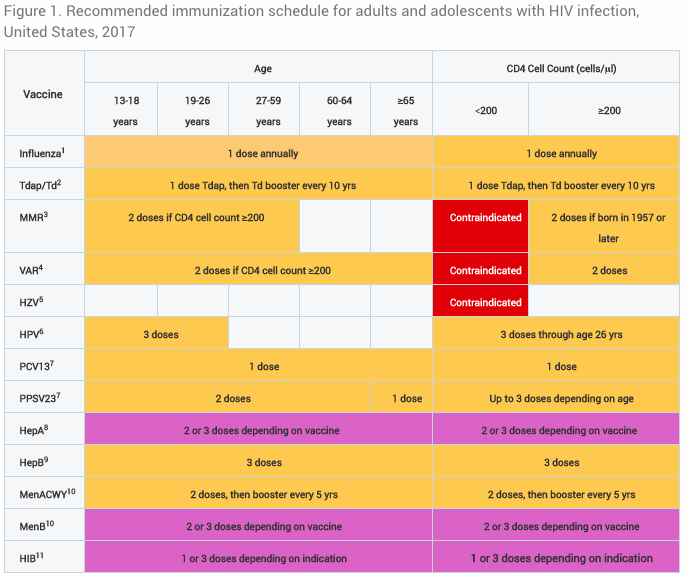 The reduction would keep a healthy individual unharmed while still inducing an immune response to form antibodies, however it is considered dangerous to administer these kinds of vaccines to HIV positive people. Some physicians will decide to administer these kinds of vaccines if the patient has had excellent control of his/her disease and is strong enough to take for example, the influenza virus vaccine without any major complications. Yes if the vaccine is not an attenuated vaccine. Being HIV positive doesn't mean "no immune system" right away. The damage to the immune system goes in function with the viral load and the CD4 count; if the viral load is low the HIV positive individual can still benefit from vaccination, moreover he should be vaccinated because he is more exposed to infections than an average person. source: HIV InSite, University of California San Francisco. I would suggest also reading more about CD4 count in HIV patients and viral HIV load. A person with AIDS cannot be vaccinated. The immune system is no longer functional and is unable to mount an immune response to your vaccine. However if the vaccine is an attenuated vaccine (which is the case for most vaccines made today), then all your be introducing into the body is parts and pieces of a virus or bacteria. These piece can trigger an immune response in a healthy person but as they just pieces, are not a live cell or a functional virus. So in a person with AIDS, the attenuated vaccine will be harmless. A person with HIV can be vaccinated. The HIV virus is in the body multiplying. However the immune system while damaged is still functional. Not the answer you're looking for? Browse other questions tagged microbiology immunology virology vaccination hiv or ask your own question.